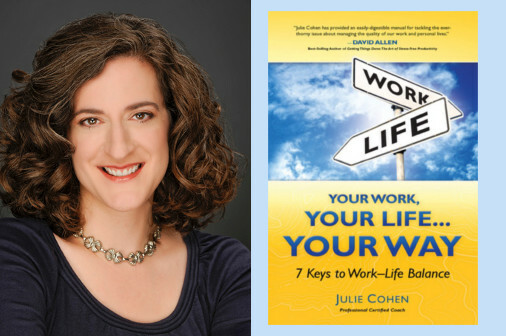 Philadelphia-based leadership/executive coach Julie Cohen, PCC, is founder and CEO of Work. Life. Leader., a leadership and professional development program for emerging and developing leaders. She is the author of Your Work, Your Life…Your Way: 7 Keys to Work-Life Balance, a blogger for Huffington Post and Working Mother, and a columnist with The Philadelphia Business Journal. Follow Julie at www.Facebook.com/7Keys or @jccoach. 1MFWF: The term “work-life balance” tends to mean different things to different people. What do you mean by it, and why do you use it in your book? Julie: I define ‘work-life balance’ as the unique mix of choices we each make based on our values, priorities, and goals which gives us personal and professional satisfaction. This combination of choices is unique to each of us and it evolves throughout the course of our lives. The term work-life balance has been maligned over the past five years by those who believe the phrase sets up an unattainable goal of balance, which creates undue stress and pressure. Many terms have replaced the phrase, work-life integration being the most popular. I chose to keep work-life balance in my book after surveying hundreds of people about their thoughts on the term, and with what it should be replaced. The overwhelming feedback I received was that everyone understands what ‘work-life balance’ means. I actually wrote a column about this last year in The Philadelphia Business Journal called Work-Life Balance: We’re Focusing on the Wrong Words. In many years working with hundreds of clients, not one has ever come to me and asked for help addressing their ‘work-life integration’. Let’s focus on addressing the real issues, not the vernacular. 1MFWF: How did you settle on seven keys, and are they a defined prescription that is the same for everyone or do they differ based on individual experience? Julie: I developed the 7 Keys to help my clients solve a problem it seemed just about all of them were facing. Regardless of why each client came to me for support—enhanced leadership capabilities, communication skills, conflict management to name just a few—just about every one of them was dissatisfied with the mix of time and energy they spent on their professional responsibilities and how it was impacting their personal satisfaction. I saw an opportunity to provide a coaching solution to this challenge. Initially, I identified 7 Barriers that get in the way of someone being both personally satisfied and professionally effective. From there, I applied coaching principles to create exercises and tools that an individual could use to change behavior for greater satisfaction. This evolved into the 7 Keys. Each chapter of the book describes a Key and the process needed to assess if you’re impacted by the corresponding Barrier, and then guides you through how to use that Key to make concrete changes in your work and life situation. The exercises are completely personalized as each reader follows a path based on his/her own situation and needs. 1MFWF: Much of your book focuses on inward reflection, but you also note that “none of us lives in a vacuum”. How might organizational culture impact someone’s ability to pursue work-life balance? Julie: I address this issue in Key 6: Navigate an Unbalanced Organizational Culture. Sometimes the culture of the organizations we are a part of does not support and even works in opposition to our work-life balance preferences. The operating rules of these organizations (often our employer, but also other organizations we’re involved with, including professional associations, religious institutions, social groups, and even our family) can set us up for situations in which we feel we have little choice or opportunity to positively impact our work-life balance satisfaction. Those written and unwritten rules include: ‘face time’, where it’s expected that you are seen and in an office in order to be doing your job well; ‘pay your dues’, where it’s expected that you will have to overcome a variety of often strenuous hurdles in your job in order to be seen as committed and successful; and, ‘in loco parentis’, where the organization acts in a parental role, wanting to know everything you’re doing and when you’re doing it, and might change what you’re doing without much input or notice from you. If you identify challenges with your organizational culture, it often feels like you are stuck. I write more about some of the solutions you can employ in these situations, but in addition, the work of 1 Million for Work Flexibility is critically important to support many of us struggling with this Key. 1MFWF: You recommend that your readers do exercises along the way as they read your book. How do you address concerns that it may be hard to find time for these efforts when work-ife balance is already a struggle? Julie: That’s a concern I hear often… I have no time to address my work-life balance challenges so how can I read the book and do the exercises? And, I understand what that feels like as I personally struggle with these challenges myself every day. I believe by investing a few minutes each day or 15-30 minutes a week, one can learn new ways of operating that can save time, increase your satisfaction and sanity, and enhance your professional effectiveness and impact. The book was designed in very small chunks so you can actually read about part of a Key and then do one exercise over a few day period. I believe the time and energy you’ll gain will be well worth the investment. 1MFWF: Is there a particular key that you’ve found especially helpful in your own life? Julie: For most readers, there are a few Keys that they are already good at, and usually three or four that if integrated could have a big impact on overall satisfaction and effectiveness. For me, the two Keys that are most relevant right now are Key 4: Design Reasonable Expectations and Key 7: Engage in Self-Care. I am often my own worst enemy and set expectations for myself that make my work and life overwhelming. It could be trying to get a project done in too short of a time frame, or feeling the need to immediately respond to my clients when they call or email. Self-Care is also another Key in which I easily lose focus on but has a very positive impact when I nurture regularly. When I’m at my busiest and most stressed, it’s often my yoga class, a trip to the gym, or time on my piano that I cross off of my calendar or to-do list. I regularly remind myself that these self-care choices are the fuel that both energizes me and enables me to operate at the level and intensity that I do.